Sub: Observance of Rashtriya Ekta Diwas (National Unity Day) on 31st October, 2018 to commemorate the birth anniversary of Sardar Vallabhbhai Patel. Enclosed please find a copy of DO. 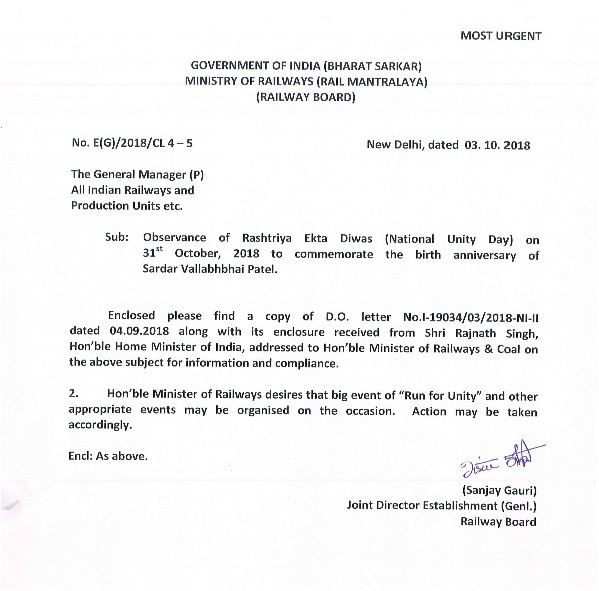 letter No.I-19034/03/2018-NHI dated 04.09.2018 along with its enclosure received from Shri Rajnath Singh, Hon’ble Home Minister of India, addressed to Hon’ble Minister of Railways & Coal on the above subject for information and compliance. 2. Hon’ble Minister of Railways desires that big event of “Run for Unity” and other appropriate events may be organised on the occasion. Action may be taken accordingly. Observance of Rashtriya Ekta Diwas (National Unity Day) on 31st October, 2018 to commemorate the birth anniversary of Sardar Vallabhbhai Patel.